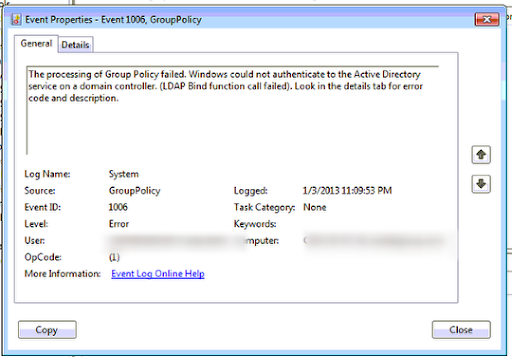 If you have problems with users at a Branch Office site that has a Read Only Domain Controller (RODC) such as no metwork drives, failed logons, no resources, then you may have a problem with replicating computer account passwords to the RODC. I had been having issues with a Branch Site where users were stating that they could not access resources on the network, logins failed and generally it was hit and miss for them if they could access resources. I started by looking at the Domain Controller at the site, this was a Windows 2008 R2 RODC. 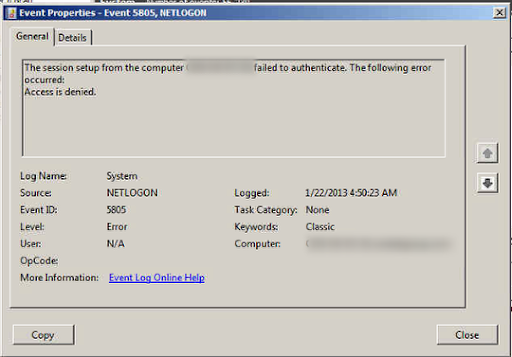 In the event logs I found this error Event ID 5805 NETLOGON, the computer account was failin gto authenticate in the domain, the most likley cause the coomputer account password had not been replicated to the RODC and so the authentication attempt failed. 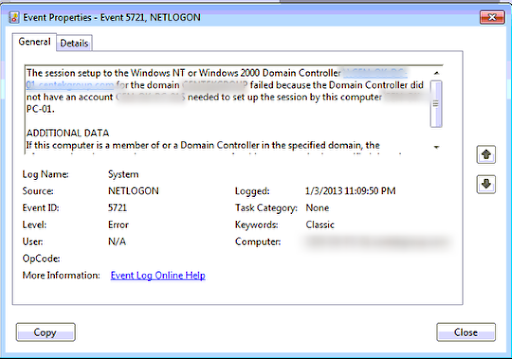 Back on the Client PC I was getting the Event ID 5721 NETLOGON that the computer account failed to connect a session to the domain controller because no computer account could be found in the domain. I knew there was a computer account in the domain so this made me think, is it the Read Only aspect that is the issue here. On the Client PC again I had further event log errors that suggested authentication problems with the Domain Controller so I started to look at fixing these errors. 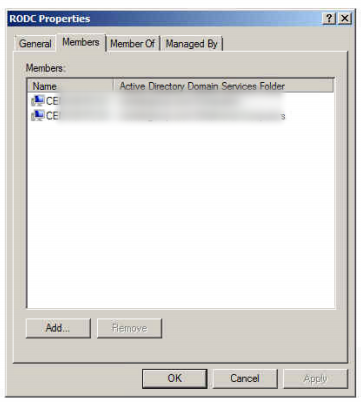 What you need to do is create a Domain Local Security Group on your Write Domain Controller and then add to this Group the computer accounts for the RODC Site. 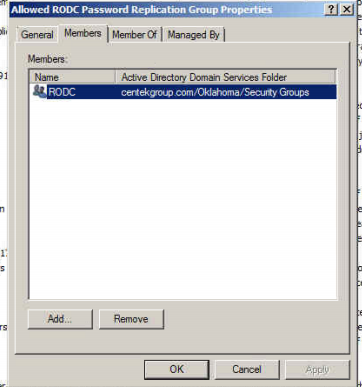 Here you can see I have created a Domain Local Security Group called RODC and I have added to this the Computer Accounts for the workstations in my RODC Site. What I will do know is nest this Group into a fixed Domain Group that allows replication of account passwords to occur to a RODC. 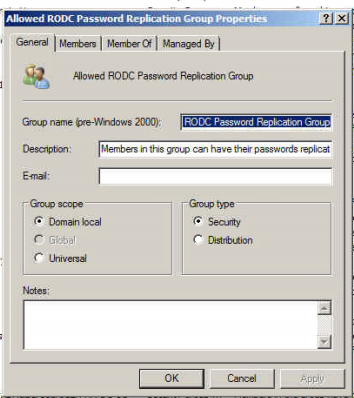 In Active Directory is a Security Group called Allowed RODC Password Replication Group, this is a Group specifically allowed the permissions to replicate account passwords to a RODC and update them on that DC. So in reality making it not Read Only for the Account Passwords butmaking sure that when you join a computer to the domain the password assigned to the computer account is replicated to the RODC. 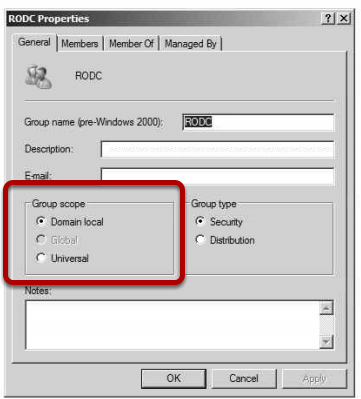 Now if we have all out RODC Site computers in the Security Group RODC then we now nest this group in the Allowed RODC Password Repication Group, this allows the permissions of this group to be inherited by all the computer accounts in our RODC group. Once this is done you can use the CMD to force a replication of the Computer Account Passwords to the RODC Site, this is expained in the Tech Net article but consists of the following. When this completes the replication of the Computer Account password for the workstation in the RODC Site is replicated and when you start the computer you no longer have authentication issues with the RODC.